Absolute levels of staffing in public agriculture research and development (R&D) vary considerably across the 39 countries in Africa south of the Sahara participating in the Agricultural Science and Technology Indicator (ASTI) survey (Map 1). 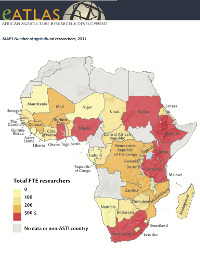 In 2011, Ethiopia, Ghana, Kenya, Nigeria, South Africa, Sudan, and Tanzania each employed more than 500 full-time equivalent (FTE) researchers each1. Despite recent challenges, many western African countries have maintained relatively large pools of well-qualified researchers (those holding PhD and MSc degrees) (Map 2). In contrast, 11 countries employed fewer than 100 FTE researchers each.1 Despite recent challenges, many western African countries have maintained relatively large pools of well-qualified researchers (those holding PhD and MSc degrees) (Map 2). In contrast, less than half of researchers in Botswana, the Democratic Republic of the Congo, Eritrea, Ethiopia, Guinea, Guinea-Bissau, Lesotho, Liberia, Mozambique, and Zimbabwe hold graduate degrees. Map 3 shows the number of FTE researchers per 100,000 people who are economically active in agriculture. While the overall average for ASTI countries is 7 FTE researchers per 100,000, only Botswana, Cape Verde, Gabon, Mauritius, Namibia, Nigeria, and South Africa each employ more than 20 FTEs per 100,000 agriculture sector workers.